Premier's quality resharpening service using proper machines or methods. Resharpen your blades, combs or cutters. See our "Resharpening Form" below if you would like to mail a completed form with your blades, combs & cutters or hand shears for resharpening. Recondition Surcharge - To recondition and/or fix severe rust before sharpening. Per blade set (top & bottom), comb or cutter. Fill out Premier's Professional Sharpening Services form (above). Wrap your items securely and place in a box for shipping. Be sure to include your completed form in the box. Return shipping will be charged as follows: For any number of comb/cutters or blades under 4.5 lbs the set cost is $7.00. If over 4.5 lbs the set cost is $10.00. Premier will return ship via ground service. If you want an air service please call for a quote. Call us if you have questions: 800-282-6631. Large blades are sharpened on a $65,000 automated lapping machine. The result is equal to (or better) than new. Combs and cutters are done on a high speed grinder. Imprint your name or farm name, address, and phone number. If you are interested in this service, see item #868600 above. Please indicate what you would like engraved on them and include payment with your next resharpening service. This service may delay reshipping by one day. 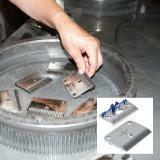 We can engrave up to 4 lines and 18 characters per line on the bottom blade of a clipper blade set. On top blades, combs and cutters we can do initials only. 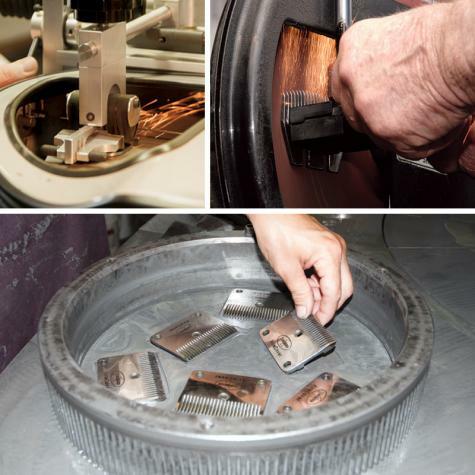 Most large clipper blades are sharpened on automated machines. Blades for camelids are double ground for a superior edge (if requested). 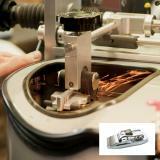 Combs and cutters are sharpened on high-speed grinding wheels by our sharpening experts. Good enough that we now sharpen over 50,000 blades, combs and cutters a year. Our offer—exchange a used, dull or rusted Lister® blade set for a new Premier blade set for only $31 (plus shipping). You save $17! How do you save $17 a set? You save $10 off a new blade set from Premier (they retail for $41) plus the $7 resharpening fee on the used blades. Must it be an exact upgrade? Fine blades for fine blades? No. Any Lister® blade may be exchanged for any Premier Surgical, Fine, Medium or Coarse blade in any combination (i.e. a Premier Fine for a Lister Medium). Note: Super Surgical and XtraCover blade sets can be included in the offer. Super Surgicals will be $45 and XtraCovers will be $33. Why only Lister® blades? Because they are the only blades that interchange (fit the same machines) with Premier blades. We will not ship these new blades until we receive your old Lister® set(s). Reshipping cost still applies. Applies to blade sets, combs or cutters that have been damaged by other's sharpening and thus requires extra time on our machine. Also applies to severely rusted blade sets, combs or cutters. Applies to blades, combs or cutters sent to us that show light rust or still have dirt, wool, hair or lanolin upon them. An edge that works for sheep, cattle and horses often disappoints those clipping or shearing llamas and alpacas. It takes double the grinding and lapping time to get blades and combs "right" for this purpose. It will save you time and hassle in the end if we know your needs and take the time to get them right for you. Failure to lubricate blades and cutters often enough with a #10 white clipping oil. Why don’t users oil more often? They assume water (in wet wool) is a lubricant. It isn’t. They fear excess oil will stain white wool or hair. Prevent this by putting only 3 drops of a white oil on the blade or tips. Run the machine for 3 seconds. Wipe away any surplus oil. Resume work. Why is rust a concern? Rusted blades and combs are harder to push through fiber. 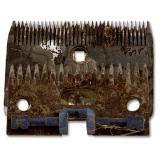 Rusted blades/combs/cutters won’t hold an “edge.” Blades are made of high carbon steel. It will rust in hours. 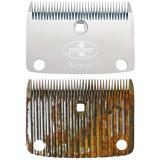 The weak acid from your fingers on blade/comb steel will cause rusting within 24 hours. So it’s critical, after every use, to clean blades with hot water, dry and coat them with real oil (not spray-on coolants). Coolants lower blade/comb/head temperatures...but they are not lubricants. They do not reduce friction. So always use coolants in addition to, not in lieu of, high-quality oil. Beware—Blades, combs and cutters can be easily damaged (and even ruined) during sharpening by those without proper machines or methods. Premier is not responsible for keeping orders separate when sending in multiple orders in one box. #10 White Clipping Oil, 8 oz btl. 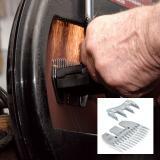 Snap-on A5 blades for general clipping of cattle, hogs, sheep, goats, horses and dogs. 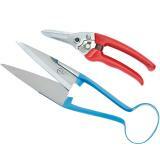 Our best hand shears. Use to trim away wool and fiber with ease. Low noise during shearing. Comfortable grip for prolonged use. The gold standard hoof trimmer for goat and sheep hooves. Japanese steel blades are 1 3/4" long. Choice of smooth or serrated blades. Number of reviews: 64 customers reviewed this product. Recommended: 62 out of 64 said they would recommend this product to a friend. They always do a great job for me and have a very fast turn around. I always recommend Premier’s sharpening service. Always a speedy turn-around and have not been unsatisfied yet. Woozer! I mailed my large Premier blades on a Thursday to be sharpened, they were in my mailbox on the following Monday! Amazingly fast service ~ I will definitely use their services again. Thank you. The resharpening service is exemplary. They have a very quick turn around (usually no more than a week from mailing to and receiving back). I can depend they are sharp and packaged well for storage until I need them. 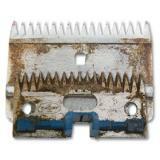 We sent six small clipper blades to be sharpened, and we were surprised on the price and the quick turn around. I couldn't wait to see how they worked, and it was like using new blades. I will use Premier in the future.